First released by Intel in June 2013, the Enhanced Serial Peripheral Interface (“eSPI”) is designed as a replacement for the Low Pin Count (“LPC”) bus. eSPI supports communication between Embedded Controller (EC), Baseboard Management Controller (BMC), Super-I/O (SIO) and Port-80 debug cards. eSPI was available in the Sky Lake chipset (2015) and is available in the Kaby Lake [current] chipset. Cannonlake will support eSPI and is slated for release the second half of 2017. Icelake is scheduled for release in 2019 and it will mark the first chipset when eSPI becomes mandatory. Prior to this specification, Embedded Controller (EC), Baseboard Management Controller (BMC) and Super I/O (SIO) were connected to the chipset through the Low Pin Count (LPC) bus. When used in conjunction with our Data Center™ Software you will be able to capture and display eSPI bus data in true real time through the Promira Serial Platform. Total Phase provides the only protocol analysis software in the industry with true real-time performance and cross-platform support for Windows, Linux, and Mac OS X. 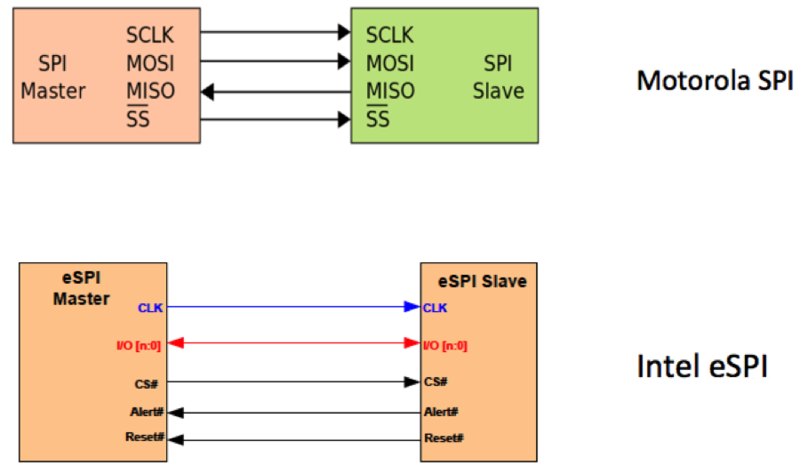 While eSPI utilizes the physical interface designed for SPI, including the master-multi slave topology and data sampling rules with respect to clock, the similarity ends there! eSPI has a transaction layer on top of this, which defines a packet based protocol. Data Center is a world-class capture and display visualization tool to help accelerate your eSPI development. For more information on the eSPI specification please visit the Intel site. In addition to non-intrusively monitoring eSPI, Total Phase also offers eSPI Active Example Files. These files are available for all Promira platform devices with SPI Active - Level 1 Application, SPI Active - Level 2 Application, or SPI Active - Level 3 Application enabled. Performance (I/O compatibility and clock speed supported) matchs your licensed SPI Active application level. eSPI active examples functionality is not available for Promira Serial Platform units without licensed SPI Active Applications. The purchase of your eSPI Analisys Application includes one year of support, allowing you to download any updates for this application for 12 months after purchase. The eSPI Analysis Application is a download that runs on your Promira Serial Platform unit. Once you have purchased a Promira Serial Platform, you'll be able to instantly download and add new applications as they become available. The Performance of the Promira Serial Platform is determined by applications licensed for a specific unit. How Do I Use the Promira Serial Platform to Simulate an eSPI Master? How Can I Set Up the Master eSPI Behavior I Need with the Promira Serial Platform? I need to capture high-speed eSPI traffic, what do you recommend?